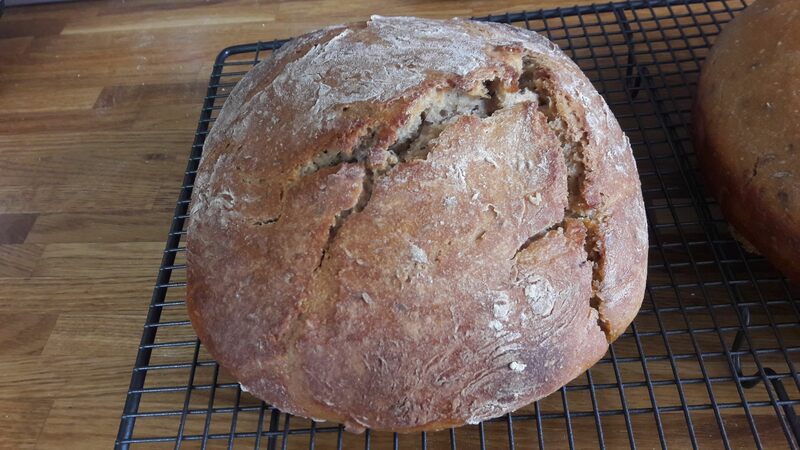 Having made a super sour dough rye bread , I now thought I would have a go at one using baker’s yeast as this is a quicker option. Only rye flour is used which does make it a harder to handle dough. In a bowl mix the yoghurt and water , yeast , sugar and flour. Leave for a while until it starts to bubble. Mix the rest of the flour, salt and caraway seeds in a large bowl. Add the yeast mixture to the flour mixture and mix with a wooden spoon. Aim for a “wet” mixture, adjusting with water or flour as necessary. Cover this with a cling film or a cloth and leave overnight. 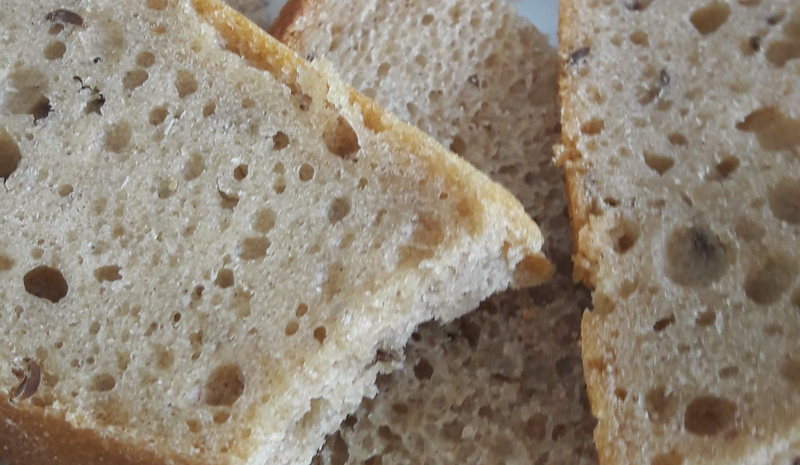 This will make 2 loaves – either two round or oval loaves which you can place on greased baking sheets or you can use small baking tins – shallow ones rather than loaf tins work out best I think – I used a 16 x 27cm mermaid tin. This dough is very hard to work with – I cut it into two and shape each piece without much kneading and try not to add much extra flour. Cover and leave to rise – this may take several hours – you do not get much of a rise. Pre-heat the oven to GM 4 – 180°C. Brush the top of the loaf with hot water and sprinkle with caraway seeds. You can make 1 or 2 cuts on the top of the loaf. 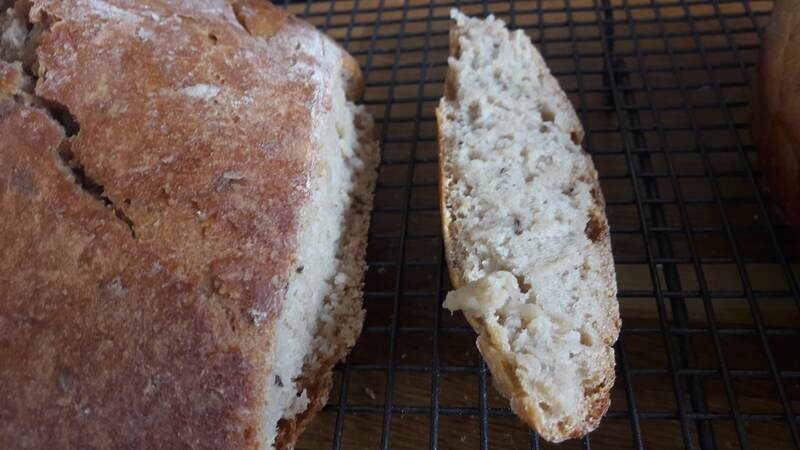 Whilst experimenting with this recipe I found that if you make the loaf too thick then it can burn on the outside and still be uncooked in the centre. 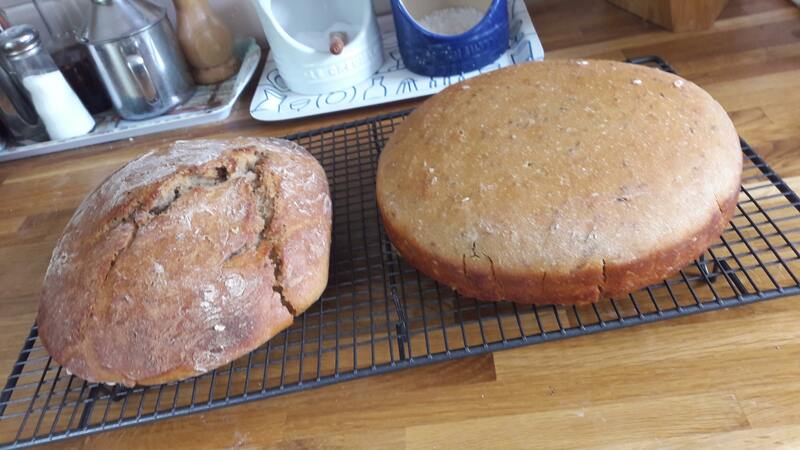 I found that a flatter loaf and the one in the rectangular tray came out consistently better. Bake for 50 – 55 minutes – I swap the trays around after 20 -25 minutes. Today is the third anniversary of my blog – I started posting on 4 July 2015 and this will be my 155th post! I am really enjoying the research, the cooking, the photography and the writing and have many more recipes to share with you all. A wedding tradition in Poland is to greet the bride and groom on their arrival at the reception with bread & salt. The bread is seen as a gift from God and is a wish that they never go hungry. The salt is a seen as a gift from the earth and is a wish that they overcome the bitterness of life. To be called bread in Poland the loaves or rolls must contain some rye. Wheat loaves or rolls are called bułki or bułeczki but this is also the name given to some cakes and buns – hence there is often some confusion! Żyto is the Polish for rye. Rye – Secale cereale is a grain and is used for bread and for making some of the best vodkas. It grew wild in Turkey and since the Middle Ages it has been cultivate widely in Central and Eastern Europe. Rye grows well in poor soil and in cold and harsh conditions. Nowadays rye is grown primarily in Eastern, Central and Northern Europe and the top three rye producing countries are Germany, Russia & Poland. Poland consumes the most rye per person at 32.4 kg/capita (2009) followed by Nordic and Baltic countries. (From an article in Wikipedia). This method of bread making uses the natural yeasts that are found on the grain and in the atmosphere. 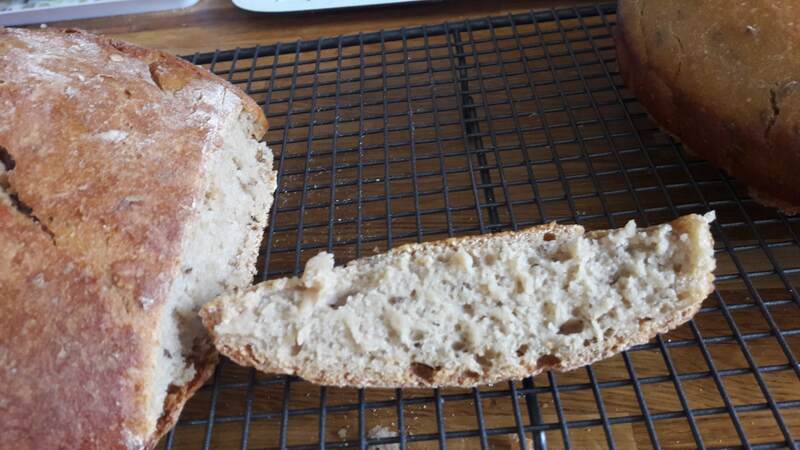 I had never tried using a sour dough method before. I have now tried it out twice – even as a former science student – it felt like MAGIC! – the results were wonderful! This recipe is adapted from one in found in my American book – Polish Heritage Cookery by Robert & Maria Syrybel. It takes around 3 days to make 2 loaves. I suppose I could halve the recipe but I am quite happy to cut and freeze any surplus and the bread keeps for several days and can always be toasted. This recipe uses whey which I often have if I have made any twarog – curd cheese. If I do not have any whey I make a mixture of around 2 parts yoghurt to 1 part water instead. At around 5 pm mix 150g of rye flour with 250ml of hand hot water in a bowl. Cover with a tea towel and leave for 24 hours. Again at around 5 pm, mix 150g of rye flour with 250ml of hand hot water and the mixture from the night before in a bowl and leave overnight or around 12 hours. Aim for a “wet” mix – it is harder to handle but gives the best results. Knead for around 5 minutes – longer if you can! Shape the dough – cut it in half and make 2 oval-shaped loaves and place them on greased baking trays or you can put them into tins – I used a round – loose bottomed tin – 20cm in diameter in my second bake. Leave to rise for around 5 hours. Place some water in a roasting tray at the bottom of the oven. They take around 50 minutes to bake – I swap the two trays around after about 20 minutes. Delicious with just butter – Well worth the wait!